This is nuanced, accessible instrumental music with a European touch. The band creates atmospheres and moods in which each musician can best serve the composition. And the meticulous, intimate sound recording reveals the music's most subtle details. With this project, drummer and composer Christian Pamerleau has begun a truly artistic process, and this album is the first fruit of that process: nuanced, intimate music that isn't overcrowded. Band members Mario Fraser on piano and Clinton Ryder on bass contribute to the unique, many-shaded moods. Recorded at Studio 270 in Montreal by Robert Langlois, the recording quality pulls the listener into a musical world where silence is just as important as the notes. Music to be savoured unhurriedly and thoughtfully. Christian Pamerleau, batteur et compositeur , entame une véritable démarche artistique avec ce projet. Voici les premiers résultats de cette dernière, une musique intimiste, remplie de nuances et d’espace. Mario Fraser au piano et Clinton Ryder à la contrebasse contribuent aux ambiances, à cette touche colorée et unique. Enregistré au studio 270 à Montréal par Robert Langlois, la qualité de l’enregistrement nous aide à entrer dans une perspective musicale où les silences sont aussi importants que les notes. Une musique à déguster tranquillement et attentivement. Very good album with a lot of subtilities and sensibility. It is original, you dont feel like you already heard this music on another cd before. 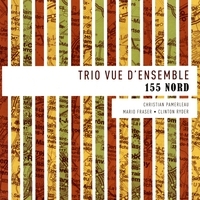 Trio Vue D'Ensemble's "Less is More" track on their 2008 recording 155 Nord not only wraps up this wonderful jazz set, but it seems to summarize the apparent philosophy of the musician's playing, as well as percussionist Christian Pamerleau's writing. The keyboard, bass and percussion elements are all used and performed in a tastefully controlled style, feeling right at home with the traditions of the great jazz trios while also incorporating subtle, more contemporary timbres and touches. The performers never resort to busyness or tired exhibitions of unnecessary flash, rather utilizing nuanced expression that show musicianship in the truest sense.